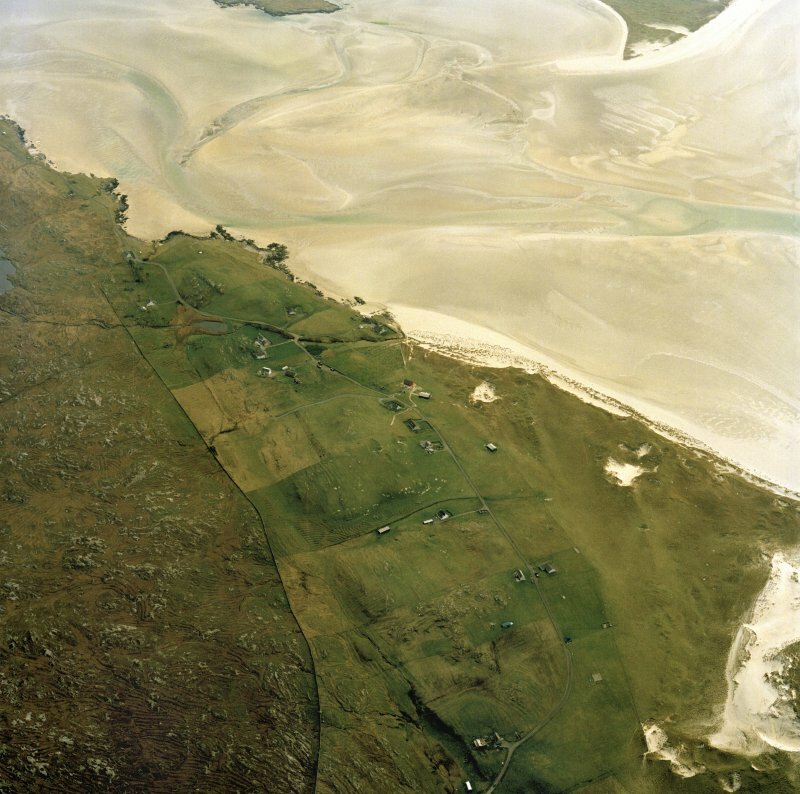 General oblique aerial view of the remains of the township of Luskentyre, with associated field boundaries and lazy beds, at the foot of Beinn Losgaintir, Harris, taken from the SW.
General oblique aerial view centred on the crofting township, taken from the ESE. 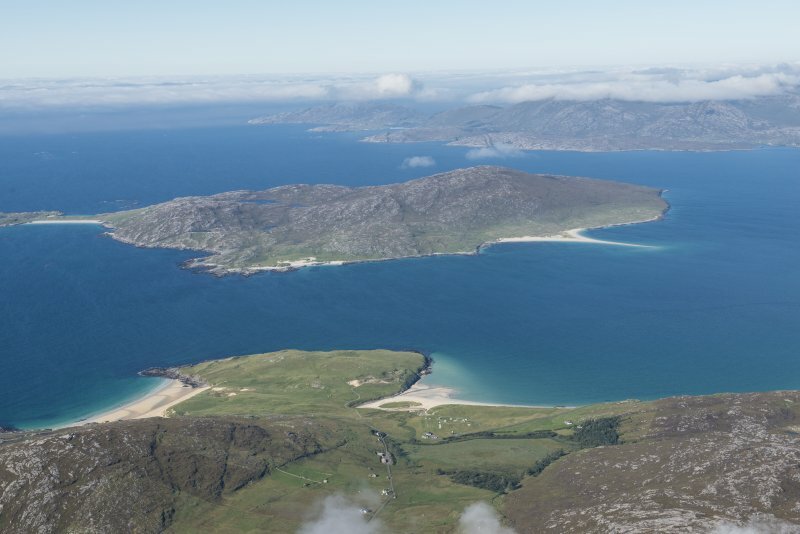 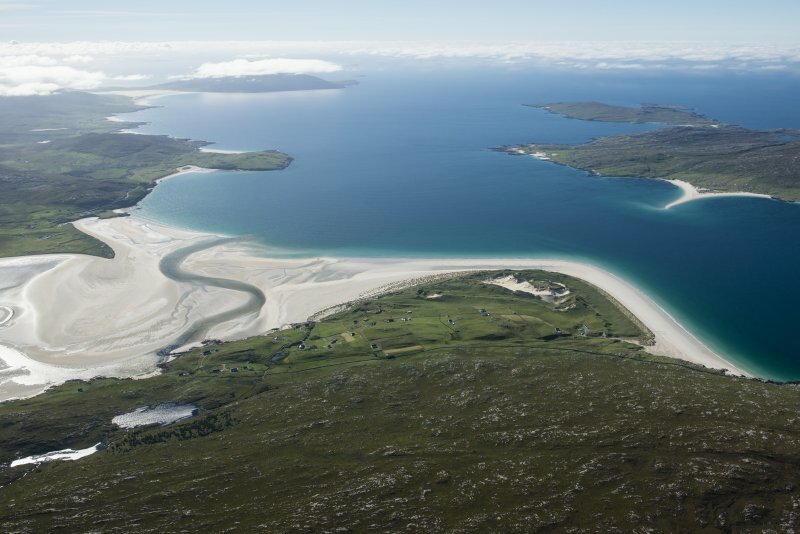 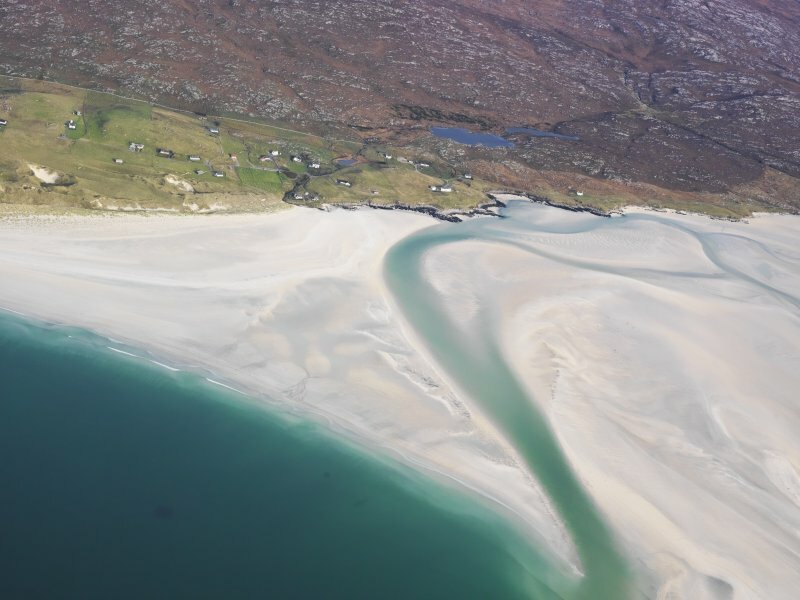 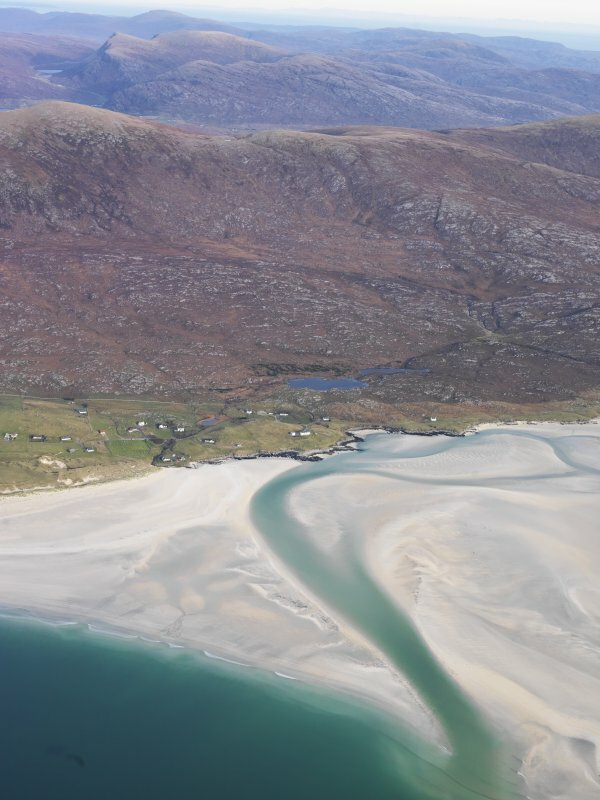 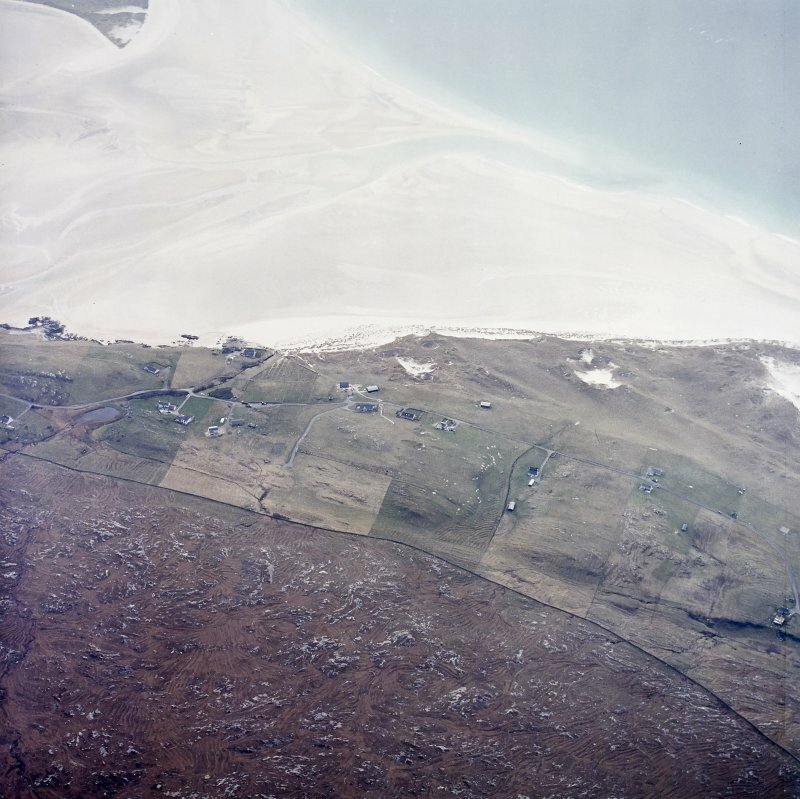 General oblique aerial view of Taransay with Luskentyre in the foreground, looking NW. 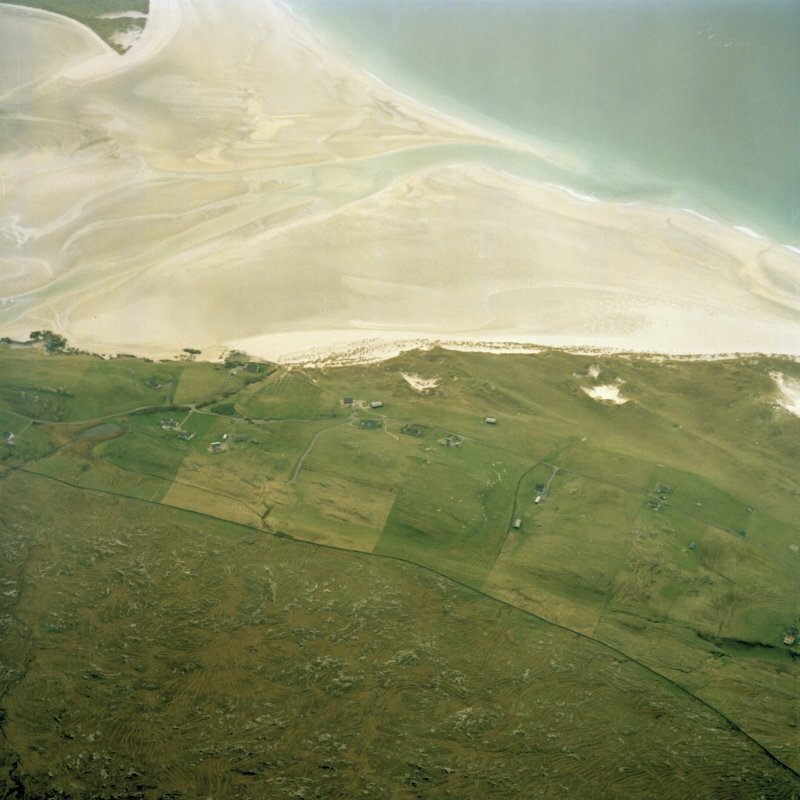 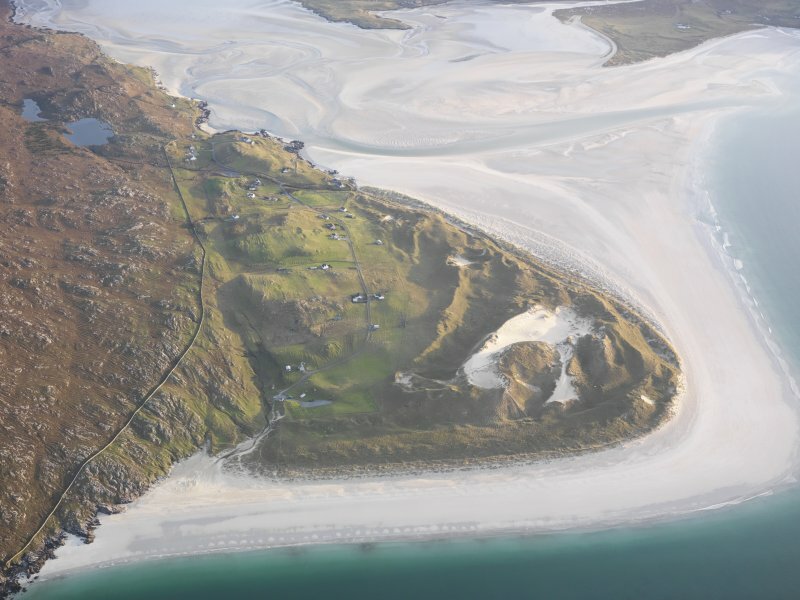 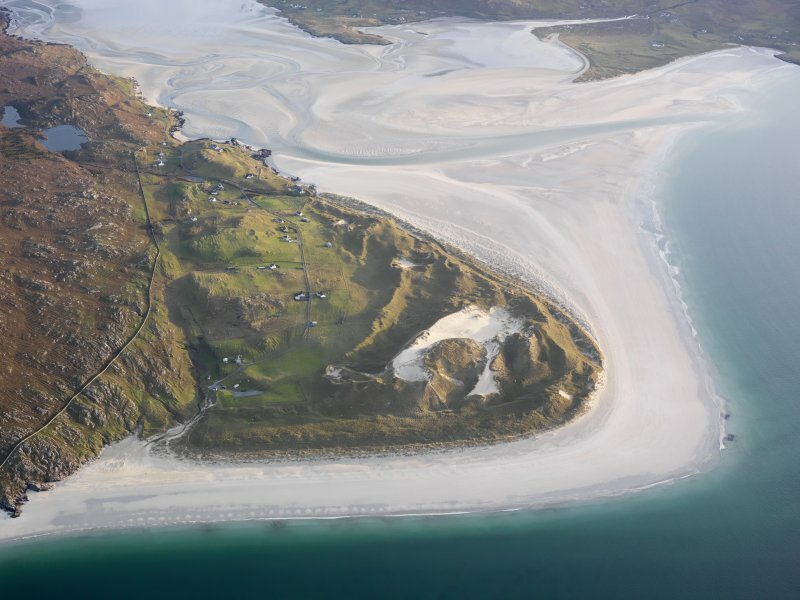 General oblique aerial view of Luskentyre with Taransay beyond, looking W.
Oblique aerial view centred on the township, burial ground and remains of the buildings, taken from the N.
Oblique aerial view centred on the township, burial ground and remains of the buildings, taken from the NNE. Oblique aerial view centred on the township, burial ground and remains of the buildings, taken from the NE. 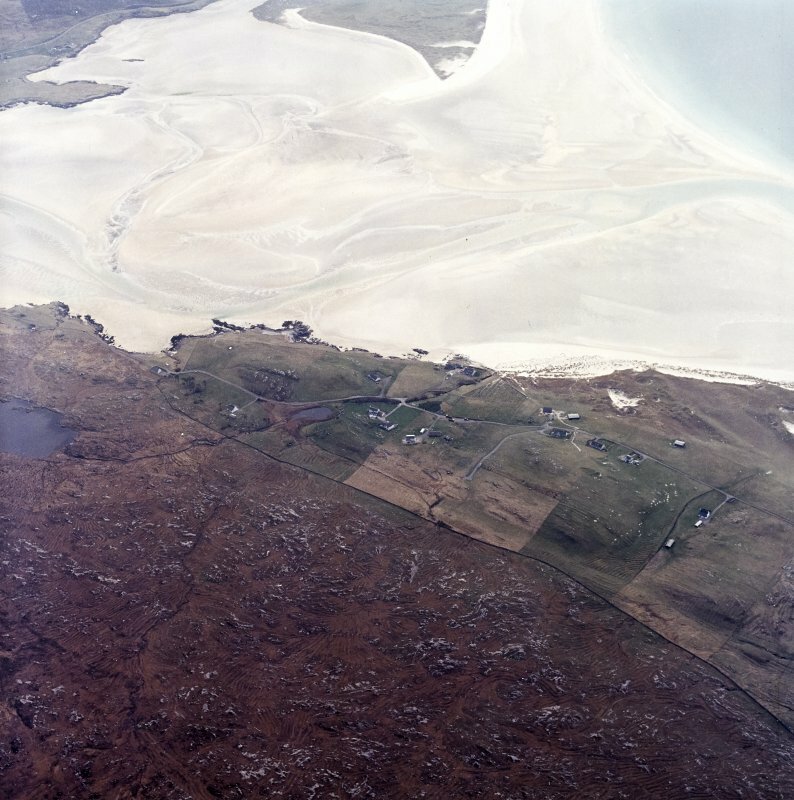 General view of building. 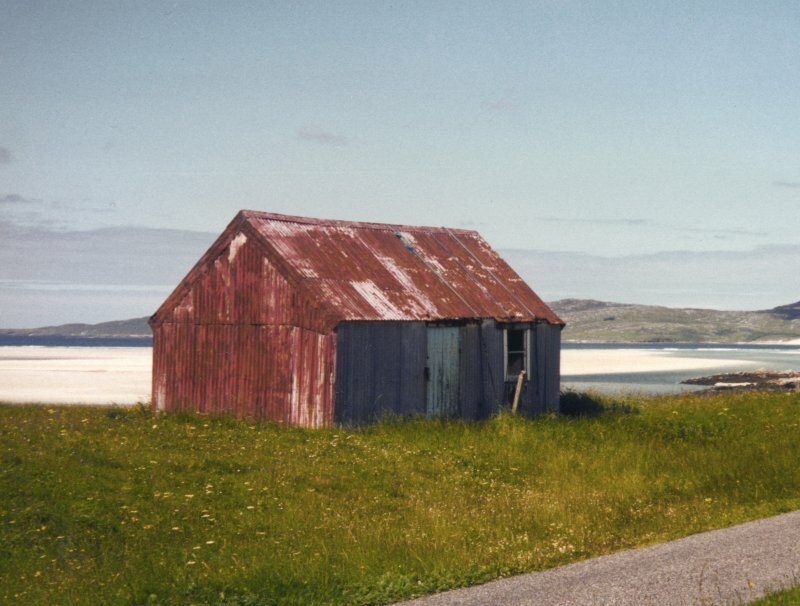 Written on reverse: 'Corrugated iron building at Luskentyre Harris'. 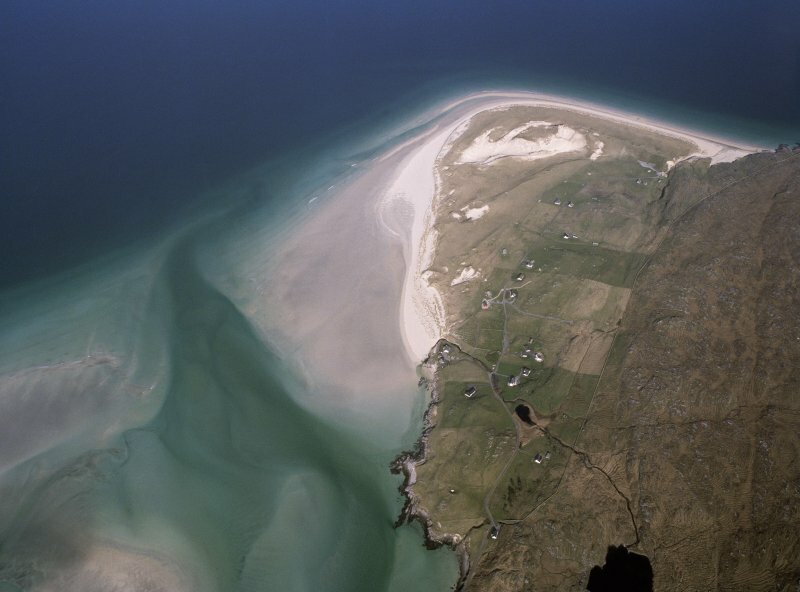 General oblique aerial view centred on the crofting township, taken from the SSE. 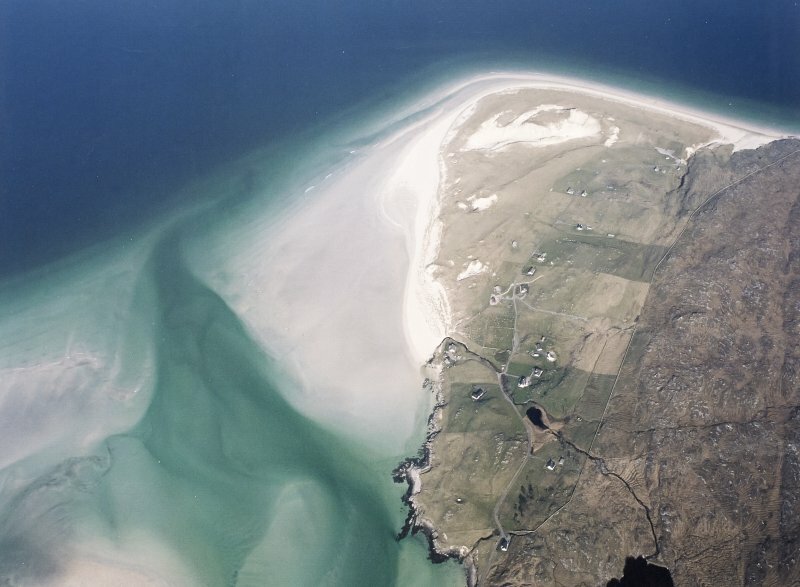 General oblique aerial view of the remains of the township of Luskentyre, with associated field boundaries and lazy beds, in the Sound of Taransay, Harris, taken from the SW.
NG 06910 99512 Amid dense undergrowth and on top of a substantial sand mound which contains the old part of Losgaintir cemetery, a gneiss slab 13mm high. 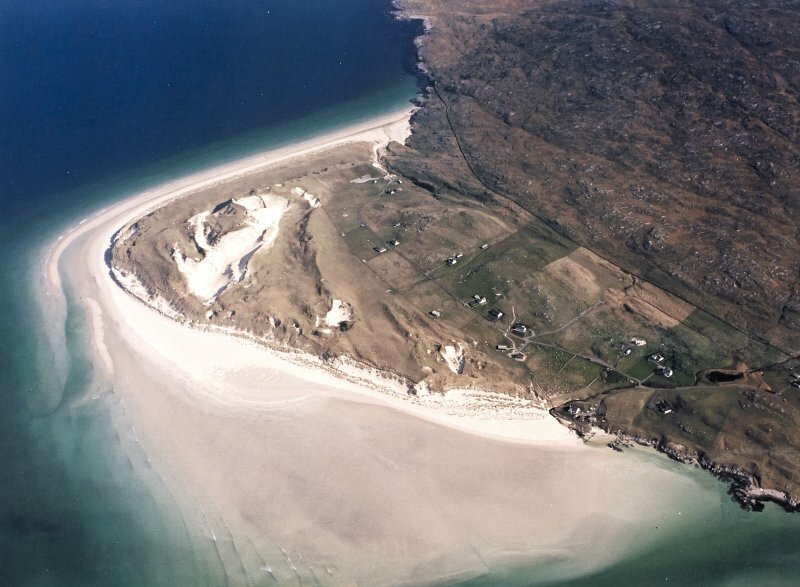 The stone appears to be an attempt to illustrate a seal's outline with other features crudely shaped to this effect, the piercing being the eye of the seal.